Bangkok (Thailand) – December 22, 2017 (travelindex.com) – Cafédirect, the UK’s largest award-winning 100% Fairtrade hot drinks company, is introducing its latest blend of premium coffees – an extraordinary darker roast and intense ‘cuppa’ in its Cafédirect 100% Arabica Espresso Roast and Ground Coffee with a superbly designed packaging – available at gourmet stores and supermarkets of major shopping malls including Central Food Hall, Tops Market, Gourmet Market and Villa Market. Created for true coffee connoisseurs, this espresso blend is crafted from specially selected beans sourced directly from coffee co-operatives in Peru and Costa Rica; and are meticulously blended and roasted to deliver on consumers’ need for a truly dark and intense high-quality coffee. This extraordinary “cooperatives-to-table” blend has been perfected by using Peru’s rich Arabica beans as a strong base of the coffee, bringing a natural dark chocolaty taste to each sip. Because of the strong roasting process, that dark chocolaty taste is made all the more powerful. As the ultimate counter-balance, Costa Rica Arabica beans have been added, which softens the mouth feel and gives the coffee a deliciously creamy finish. To help coffee lovers select a coffee strength that suits his/her taste, Cafédirect has placed a numbered icon ranging from 3 to 6 on each pack. The strength of the coffee depends on a number of factors, namely the composition of coffee beans in the blend as well as the intensity of the roasting process for coffee beans. The Arabica Espresso Roast and Ground Espresso, for example, is a 6, which means that it is a full-bodied and intense coffee, promising a flavour explosion, yet leaving a naturally sweet finish. 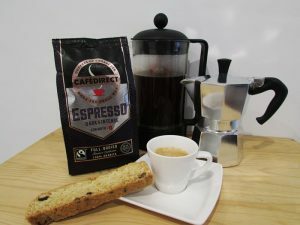 Cafédirect 100% Arabica Espresso is finely ground for easy brewing in an espresso machine, stove-top espresso pot or percolator, and cafetiere (plunger). As a pioneer member of Fairtrade*, Cafédirect’s business model entails 50% of the profits to be returned to the coffee growers who passionately nurture and harvest the beans. This not only improves the lives of the growers but also the quality of each coffee bean. Each purchase of a Cafédirect product is a small stake in the future of thriving coffee grower communities. A 227-gram Cafédirect 100% Arabica Espresso Roast and Ground Coffee is retailed at Baht 385 per pack at gourmet stores and supermarkets at Central Food Hall, Tops Market, Gourmet Market and Villa Market. Note: Fairtrade is a global movement with a strong and active presence in the UK represented by the Fairtrade Foundation. It makes a difference to the lives of the people who grow the things we love including coffee. It strives to change the way trade works through better pricing, decent working conditions and a fairer deal for farmers and workers in developing countries. 1. Cafédirect was founded in 1991 and is a leading social enterprise and 100% Fairtrade hot drinks company. 2. Through direct, personal and long-term relationships, Cafédirect partners with over 280,000 smallholder growers in 40 grower organisations across 12 developing countries. 3. The work of Cafédirect positively impacts the lives of 1.8 million people in developing countries. 4. As a business, Cafédirect is different: Growers have shares in the company and have two seats on the Cafédirect Board of Directors. 5. Cafédirect’s unique approach has seen the company paying fair prices and working directly with smallholder growers so that they can develop their businesses and increase their influence in highly competitive commodity markets. 6. Cafédirect have invested over 50% of their profits back into the growers communities they work with. 7. The re-investments are since 2009 channeled through the Cafédirect Producers Foundation, a grower-held foundation, with a total of £ 6 million re-invested to date. 8. Cafédirect has won over 30 prestigious Great Taste Awards over the last 8 years The Tarrazu Roast & Ground Coffee has just clinched a Great Taste Award in 2016.